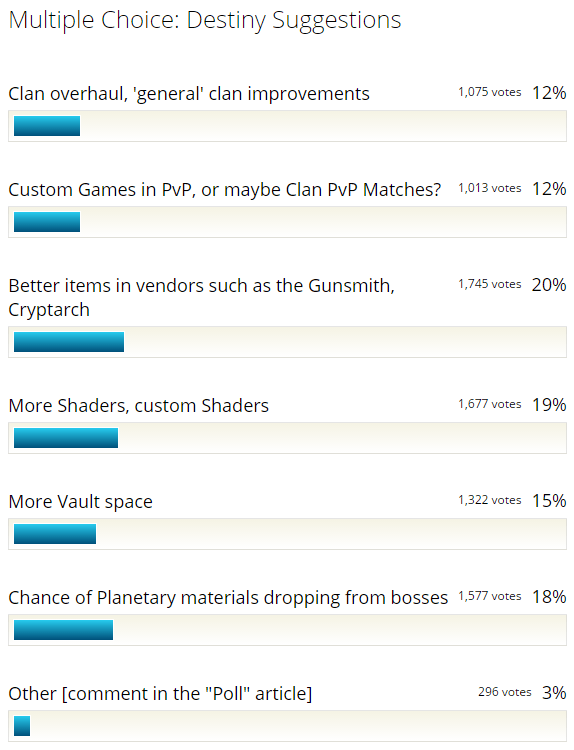 Our last poll received a great response, with tons of useful feedback for Bungie! Thankfully the highest rated feature is something that should be able to be changed fairly easily, so hopefully Bungie will improve those vendors to make them more useful. DeeJ also made somewhat of a poll on Twitter to see what people would like to see. Taking a census today. Tell me the #1 thing you would like to see added to (or removed from) Destiny. I might know them. I might not. Go! I replied that I’d like to see consistent rewards of some sort from mission/strike bosses, as discussed in this article. Recently we started up a Top 5 series, in which we give our opinions about the best of the best weapons. So far we’ve reviewed Scout Rifles, Hand Cannons, Fusion Rifles, and Exotics in general (we also have full Exotic reviews). With so many other weapons that we could talk about, we’re looking to the community to find out what’s going to be most helpful. What type of weapons would you like us to review next?